Drawing a foreshortened face is always a good challenge. I appreciate people who are reading a book very much for this! I have a tutorial about drawing skulls here where I talk about my approach to the face in perspective. People in Berlin are all so bundled up in the winter! edit. to add one person who DOESN’T bundle up: this very tall pole dancing guy I’ve seen several times on the U7! All the thanks to my beautiful Patrons on Patreon whose monthly financial contributions make it possible for me to make documentary art of life in Berlin. This entry was posted in My art and tagged "Glücklich in Berlin", art in berlin, Berlin drawing, Berlin public transit, Berlin U-Bahn, documentary drawing, drawing in berlin, life drawing Berlin., open source art, public transit art, Suzanne Forbes, Suzanne Forbes art, U-Bahn drawing, unterweg, unterwegs, urban sketching on January 22, 2019 by Suzanne Forbes. Unterwegs Nr. 5 – March bonus round! I have been making so many drawings it’s hard to keep up. These two sweet daddies were encountered on different day trips to meet Daria someplace. I hope I conveyed their amazing love and tenderness. The one above was letting his daughter go boldly ahead, not constraining her. I had to redraw a lot very quickly to convey that his arm was extended, just barely keeping a delicate hold on her hood, not pulling her back towards himself. This dad had kinda greasy hipster hair but his child was immaculate, even though it was eating some kind of chocolate-covered biscuit. I have never seen a child eat chocolate so neatly, and I have never seen a dad so thrilled to be riding the subway with his baby. And here is an unterweg drawing I like just because it’s so loose and fast! 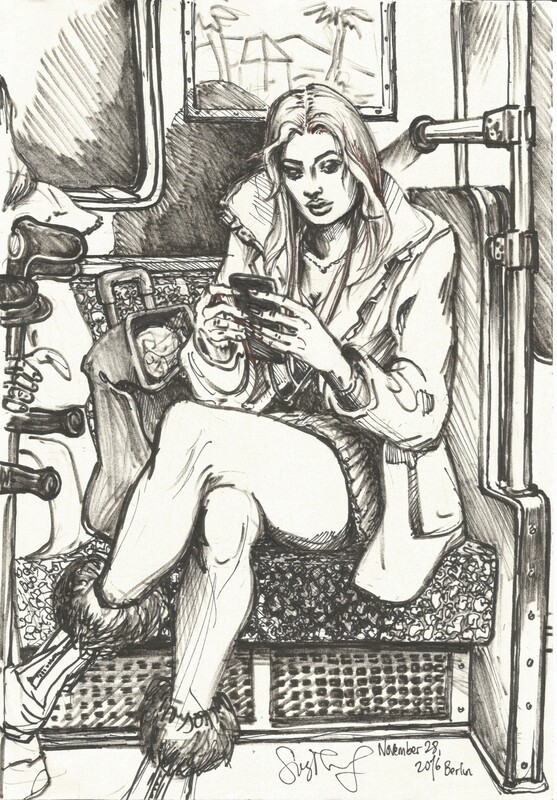 This entry was posted in Berlin, My art and tagged "Glücklich in Berlin", art in berlin, Berlin, Berlin drawing, drawing, drawing in berlin, life drawing Berlin., live drawing, portrait drawing, Suzanne Forbes, Suzanne Forbes artist, U-Bahn drawing, unterweg, unterwegs on March 27, 2017 by Suzanne Forbes. There is a bit of a thing among Berlin drawing folk, urban sketchers and life drawing people and so on, of “Unterweg” drawings. They’re the drawings you make on the U-Bahn, S-Bahn, bus or tram, as you’re underway. I find that I’m using these opportunities to draw regular people going about their day as a place to practise techniques. I can drop on a half-finished drawing and decide to add dark values, or detail, or a second person, in the most relaxed and experimental way. It’s a wonderful way to pass the time, and try new things. 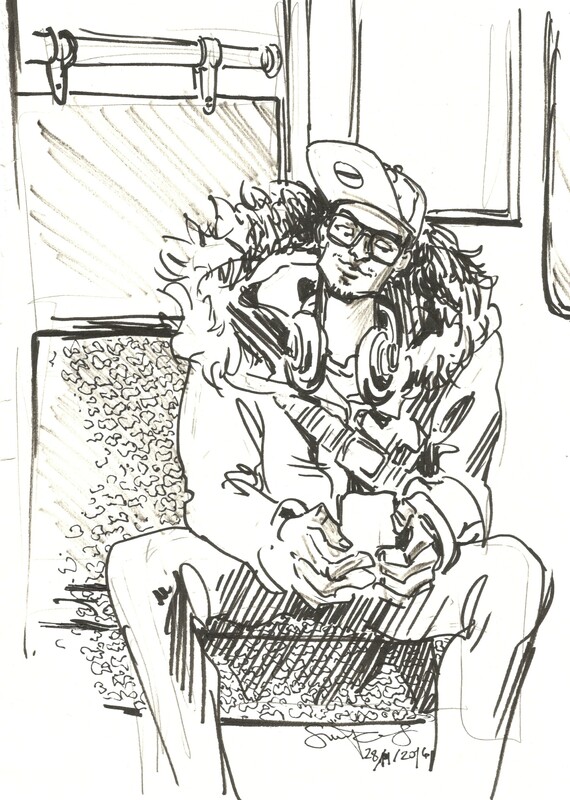 This entry was posted in My art and tagged "Glücklich in Berlin", art in berlin, Berlin, Berlin drawing, drawing, drawing in berlin, life drawing Berlin., live drawing, portrait drawing, Suzanne Forbes, Suzanne Forbes artist, traditional portraiture for alternative lifestyles, U-Bahn drawing, unterweg, urban sketching on November 28, 2016 by Suzanne Forbes. I glimpsed this little girl dancing around the subway pole, surrounded by tall black-clad guys, at the beginning of May. Then I carefully reconstructed the scene over a series of short U-Bahn rides. Since you never know which model of train you’ll get, or if there will be a seat in the correct position, detailed U-Bahn drawings tend to take a few rides! 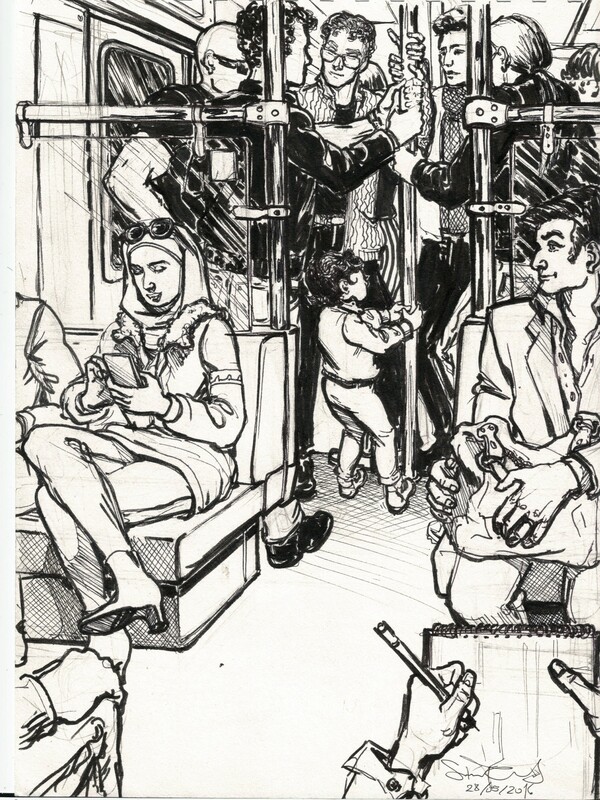 This entry was posted in Berlin, My art and tagged Berlin drawing, drawing, illustration, live drawing, pen and ink drawing, Suzanne Forbes artist, U-Bahn drawing on May 27, 2016 by Suzanne Forbes.